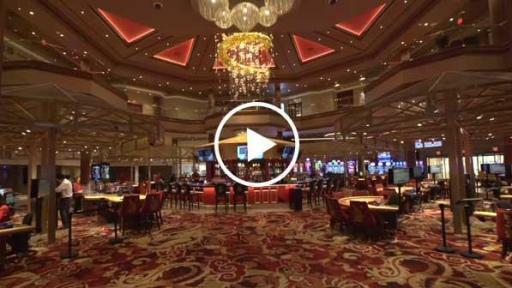 The highly anticipated Lucky Dragon Hotel & Casino, the first in Las Vegas to offer an authentic Asian gaming, dining and lifestyle experience, is now open to the public. The property commemorated the milestone with a Grand Opening Celebration held on Saturday, Dec. 3. The celebration began at 2:30 p.m. PT as the booming sound of taiko drummers called Lucky Dragon guests out to the porte-cochere where the festivities took place. After a half-hour demonstration, the executive team from Lucky Dragon joined the celebration for the traditional dragon and lion eye-opening ceremony and dragon and lion dances. President and Chief Executive Officer Andrew Fonfa, Managing Principal James Weidner, Chief Operating Officer Dave Jacoby, General Manager Matt Harkness, Vice President of Marketing Jordan Seager and Executive Chef Phuoc Luu were all present to make traditional red envelope offerings to the Lions, symbolizing good fortune to come. After an official ribbon cutting, an explosive Chinese firecracker display followed and wowed the packed crowd of onlookers. Heads of lettuce, suspended by red string over the entrance to Lucky Dragon’s casino, were consumed by the dancing lions before entering the property. A variation on the phonetic pronunciation of the word for “lettuce” in Chinese translates to "to get rich." The tradition of lions eating the lettuce is said to bring wealth and prosperity to the property. The dragon and lions proceeded into the casino and continued their celebration for several hours, as guests were treated to complimentary Tsing Tao beer and traditional GongFu service of Qinba Wuhao tea – one of more than 50 teas that will be offered at Lucky Dragon. At 10:30 p.m., guests and executives alike raised their glasses in a champagne and cognac toast, officially signaling the opening of Las Vegas’ first new hotel and casino property in 6 years. Lucky Dragon is situated on the Las Vegas Strip’s burgeoning northern corridor, just west of Las Vegas Boulevard at 300 W. Sahara Avenue. The first ground-up construction of a hotel and casino property in Las Vegas since 2010, Lucky Dragon will feature a unique and authentic Asian experience unlike any other in The United States. The authenticity of the property goes far beyond the style of cuisine and multilingual staff. From taxi stands to restaurants, signage will be in Chinese first and English second. VIP areas are elevated, signifying a heightened status for those who enter. Teas normally reserved for dignitaries on official Chinese state visits will be available at Lucky Dragon for the first time in the United States. Careful consideration was put into the design, from conceptualization through to its actualization. 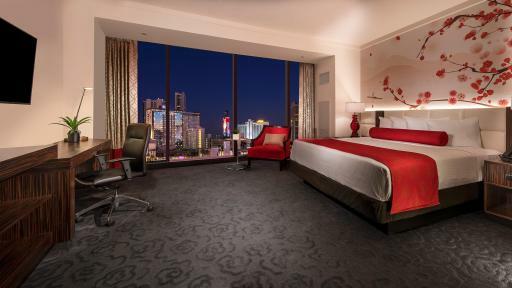 Lucky Dragon will feature 203 guest rooms, including 22 suites. Standard rooms (400 square feet) blend modern luxury with Asian flair rich in culture, while contemporary amenities ensure guests from all over the world feel at home. 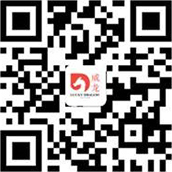 Lucky Dragon will offer the most Chinese programming of any TV package available on the Las Vegas Strip. Each room will feature tea brewing equipment and a complimentary offering of Lucky Dragon’s imported house tea selections. Standard suites (625 square feet) will feature an additional spacious seating area and larger bathroom; many will feature a Las Vegas Strip view. 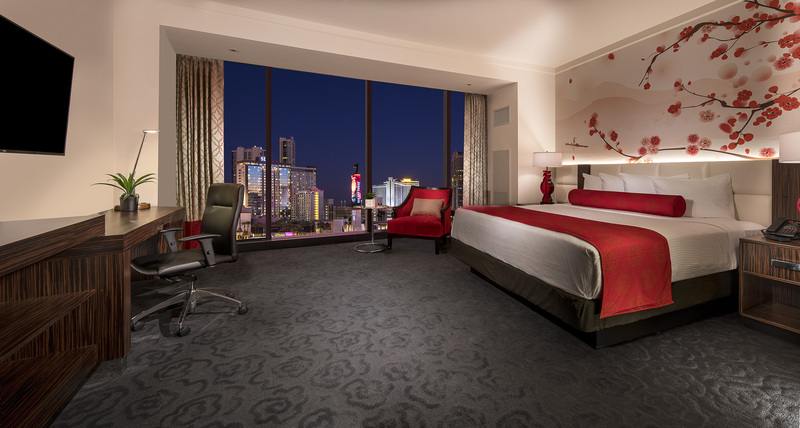 The top floor of Lucky Dragon will house The Penthouse Suite (1,300 square feet), reserved for Lucky Dragon’s most exclusive clientele. The penthouse will span the entire width of the hotel tower and offer panoramic views of the Las Vegas Strip as well as the beautiful mountain sunset. The penthouse will feature a grand foyer entryway, a guest powder room, a luxurious living room, a soaking tub and a formal dining space suitable for catered meals and events, as well as butler service. 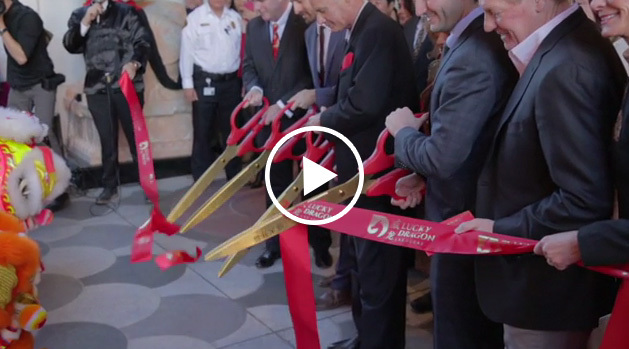 At the heart of Lucky Dragon’s authenticity lies its food and beverage program. From the variety offered by the property’s five restaurant concepts, to the extensive collection of Chinese teas, Lucky Dragon will be the city’s center for Asian cuisine. Willy Ng, of renowned Bay Area restaurants Koi Palace and Dragon Beaux, consulted with Lucky Dragon on the resort’s culinary program. Ng’s Koi Palace is widely regarded as one of the best dim sum restaurants in the Bay Area, and product from Ng’s own dim sum facility in San Francisco will be shipped in daily to Lucky Dragon. Dragon’s Alley, inspired by the vibrant night markets dotting the streets throughout Taipei and landmarks such as Ghost Street in Beijing, will introduce Las Vegas to the best street food offerings of China, Taiwan and broader Asia. The Hutong brick that lines portions of Dragon’s Alley was sourced directly from Beijing’s toppled government housing. The alleys of state-sponsored residencies that often flanked similar night markets were torn down as Beijing’s economy began to thrive. Bao Now, serving quick and easy dishes meant to be consumed on the go, will feature simple dim sum, soups, rice, noodles, congee and Boba Tea, as well as a diverse offering of teas and coffees. 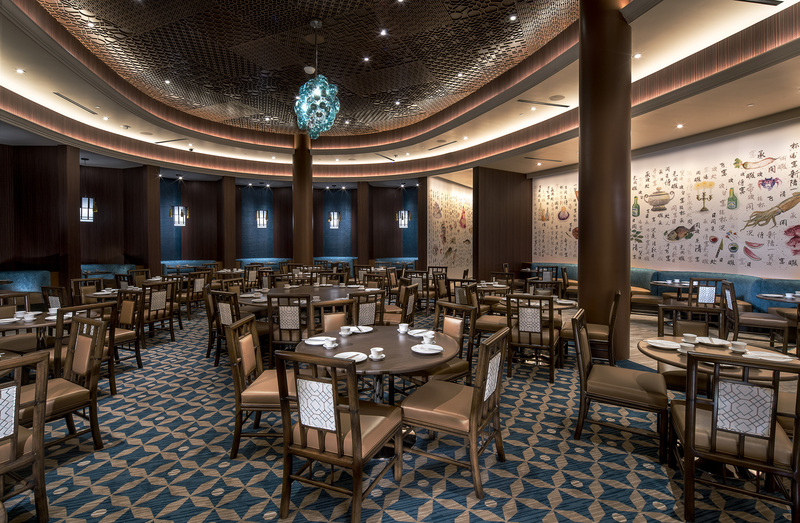 Due to its proximity to the casino floor, guests will have easy access to food and drink before, after or even during play, as Lucky Dragon guests will be permitted to dine at gaming tables. Pearl Ocean will set a new standard for dim sum in Las Vegas. 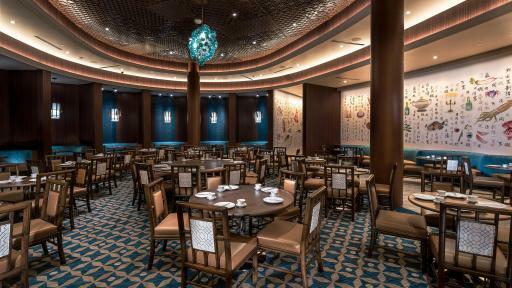 The large aquatic-themed dining room features the city’s best dim sum service, as well as a live seafood room where guests can select live exotic seafood, flown in daily, to be prepared in both traditional and modern culinary styles. Phoenix, Lucky Dragon’s 60-seat fine dining restaurant, will boast a menu of cutting-edge culinary trends found throughout modern China. Kurobuta pork, deer tendon, abalone and countless other rare, expertly prepared delicacies will punctuate the world-class service for Las Vegas’ most discerning palates. Phoenix will also boast a private balcony and finely curated wine list. Cha Garden, adjacent to the hotel lobby, blends seamlessly with the pool area to create an indoor-outdoor tea garden and lounge. Led by Las Vegas’ only tea sommelier, Cha Garden will feature an extensive list of 50 unique teas sourced directly from generations-old tea farms throughout Asia. Guests will be able to select teas knowing Cha Garden will also serve yum cha (light snacks akin to Chinese tapas) in a casual or formal service atmosphere. While tea will be the focus of the Cha Garden experience, the venue will also feature a full bar, beer, wine and cocktail program for guests seeking to engage in a more traditional Las Vegas nightlife experience. Jewel Kitchen will be the heartbeat of Lucky Dragon’s dining scene. Encapsulated by windows offering casino guests a panoramic view of the culinary masters in action, it will be Las Vegas’ only show kitchen that extends directly onto the casino floor. Two main bars will serve the hotel & casino. 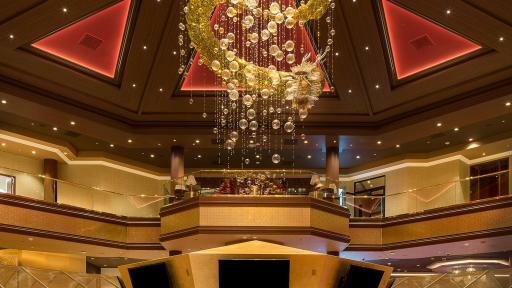 The first-floor Pagoda Bar, at the heart of Lucky Dragon’s casino gaming floor, will offer full bar service as well as a selection of teas and other non-alcoholic beverages. Video poker machines line each side of the bar’s architecturally inspired octagonal perimeter. Upstairs, the Atrium Bar will serve as the center of Lucky Dragon’s growing mixology program. A chameleonic menu of specialty cocktails will be accompanied by traditional Asian beverage options and modern libations influenced by Asian culture and recipes. Pivoting around the casino’s first-floor Pagoda Bar, the 27,500-square-foot casino floor will contain 37 tables and 287 slot machines. The majority of table games will focus on table games popular in Asia offering primarily Baccarat and Pai Gow, though Roulette, Black Jack, Three-Card Poker and Ultimate Texas Hold’em will also be available. 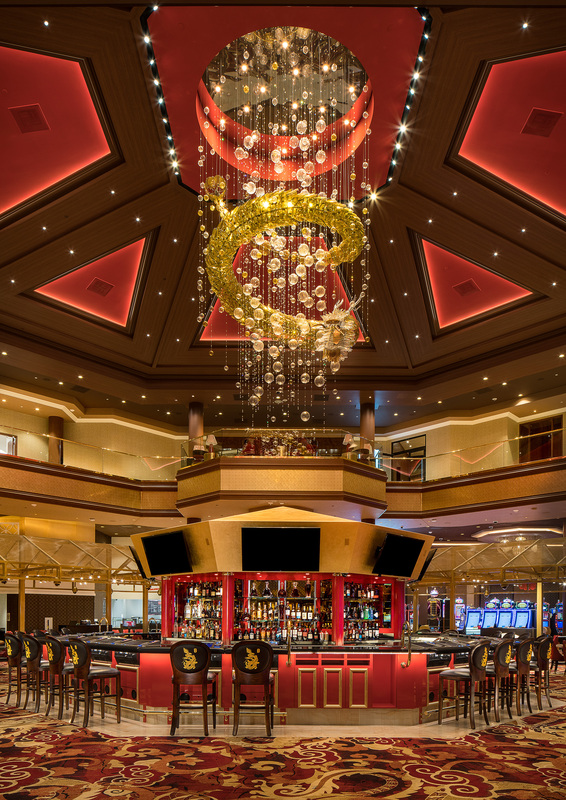 Overlooking the casino floor, and suspended above Pagoda Bar, a 1.25-ton glass and crystal dragon chandelier will cast luck and good fortune upon all below. Crafted in the renowned Crystal Valley glass blowing region of The Czech Republic, the 23-foot dragon spans nearly two-and-a-half stories. Two high-end gaming areas – The Emerald Room high-limit gaming area on the ground floor and the ultra-luxurious, second-story VIP Gaming Lounge – will serve the casino’s major players, offering gaming in an intimate environment surrounded by high-end décor, designed to bring luck and good fortune. Lucky Dragon’s pool area, an extension of the main lobby and Cha Garden, will offer guests an oasis garden escape. The shoreline infinity-edge pool and shady oak trees provide an atmosphere reminiscent of a natural pond, while the tiled mural wall and fountains adorn a modern atmosphere that includes lounge seating and luxury cabanas. 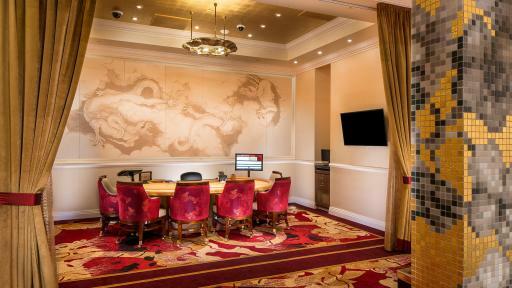 The 4,500-square-foot Sothys Spa at Lucky Dragon will offer a variety of traditional Chinese and Western treatments. The spa facilities consist of four private treatment rooms, offering services for individuals and couples, as well as a manicure and pedicure area with a panoramic view of the Las Vegas Strip. With offerings from reflexology and facial treatments, to anti-aging and massage, the Sothys spa at Lucky Dragon will provide the perfect escape for all guests. For those that prefer the comforts of their own room, a selection of spa services will be available in-room as well. 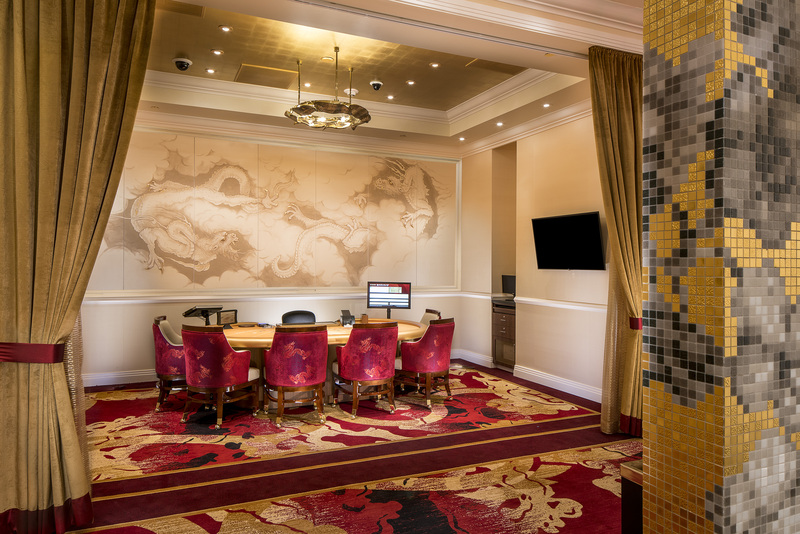 Lucky Dragon Hotel & Casino is Las Vegas’ first casino resort designed from the ground up to create an authentic Asian cultural and gaming experience. The resort is located at the north end of the Las Vegas Strip at 300 W. Sahara Ave. Features of the property include a nine-story hotel with 203 rooms, of which 22 are suites; 27,500 square feet of casino space with an emphasis on table games including Baccarat and Pai Gow as well as slots, a high limit gaming area known as the Emerald Room and a luxurious VIP gaming parlor; a pool designed to create an oasis garden escape for hotel guests; a spa with four treatment rooms including reflexology; an indoor-outdoor Tea Garden featuring an extensive list of tea curated by Las Vegas’ only tea sommelier; five Asian-inspired restaurant concepts; and staff and signage to accommodate guests from throughout Asia as well as English-speaking guests. 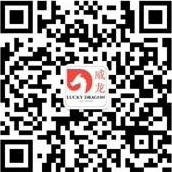 For more information, visit LuckyDragonLV.com. Follow Lucky Dragon Hotel & Casino on Facebook, Twitter and Instagram for the latest news and updates.